It’s been an interesting week with respect to my philosophy about the future of labor for knowledge workers. This post about corporate idealists and seniority got relatively popular and attracted around 10,000 readers. If you’re a regular follower of this blog, you know that one was just the latest in a series of a few posts I’ve done on this topic and you probably also know that these are coming from my work on a book. But this understandably wasn’t immediately clear to new readers, and so I got a smattering of inquiries as to where the book was for sale or whether it could be pre-ordered. I invited those folks to stay tuned or sign up for my mailing list, but alas I had nothing to offer. As you can see, this was a pretty popular sentiment, which jived with the reception my post about salary negotiation hacks received. There appears to be a great deal of appetite for reconsidering the knowledge worker’s relationship with the corporate structure. To this end, I decided over the weekend to put an end to my large-batch approach to writing this book and include anyone that wants to come along for the ride right from the outset. I wrote my initial introduction to the book and published it on Leanpub (most of the material I’d been gathering is still scattered in a large document on my personal google drive). Beware, there’s not much there, but that will change. In the coming months, I’ll be writing to the book almost the way I would to a second blog. So, stay tuned. 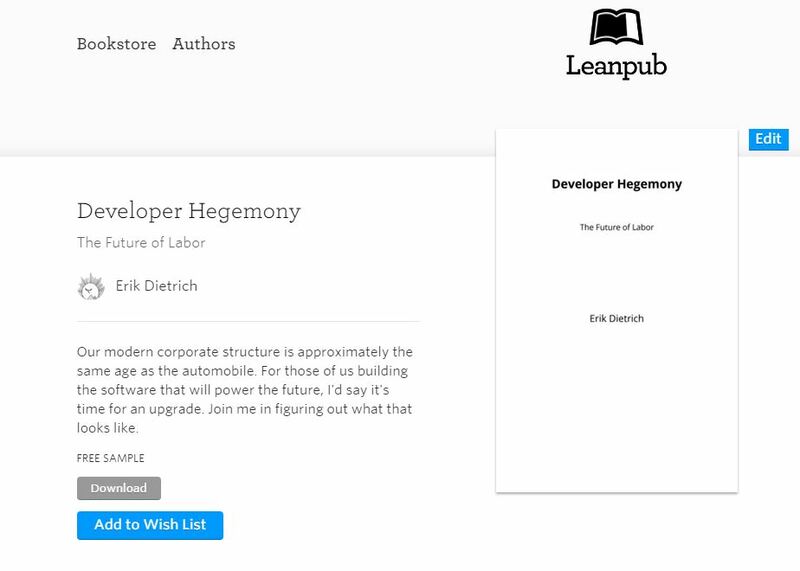 The infant book is now officially on Leanpub and officially for sale. I have absolutely no idea what I’m doing when it comes to marketing or setting price, so please bear with me. It’s doubly confusing because Leanpub offers a lot of different options for differentiated pricing. The minimum price for the book is $1 and the suggested price is $4.99. The suggested price was just the default, and the minimum price is 1 cent more than the default for no particular reason other than selling things for 99 cents seems somehow hokey to me. I considered making the initial minimum price free, since there’s not much book there, but data about whether people would pay for the thing or not is a lot more meaningful if people have to pay for it. If I made it free, I might get a lot of spurious information (lessons learned from Lean Startup and 4 Hour Work Week). Now, here’s the nuance. You can get the book for free. I wanted to be sure to offer that option to people that are regular fans and followers of the blog and will provide feedback as I write it along with support and shares. So I created a coupon that I’ll send out to the DaedTech mailing list as well as anyone who signs up for it from here forward. Also, I’m not going to lie. If you just email me, I’ll send you the coupon too, but I’d prefer to do it through the mailing list. For those of you on the mailing list, look for the coupon email in the next few days. As I said, I have no idea what I’m doing when it comes to marketing, so I hope this makes sense and isn’t crazy. I wanted to err on the side of giving too much away if I erred in any direction. Weird as it sounds to say, I’ve never regretted erring on the side of giving away content. People seem to live life petrified that they’ll give something away for free when they could have wrung a few dollars out of it, but for me, the goodwill and engagement created by giving away content has paid far more dividends down the line than a few dollars. So I cordially invite you to join me on this book journey. And, naturally, I invite you to invite as many of your friends and colleagues as you please! 🙂 I’m excited and looking forward to this, and fascinated to see how it goes. Erik great blog and it’s given me a lot of food for thought. As a blog writer myself, I love sharing the content I am passionate about and hopefully it adds value to someone somewhere. But I think sometimes it’s better when people pay for stuff , albeit a small amount, because it’s human nature to not value free things. So, I intend to read your book and pay for it and honor your effort. Thanks for the feedback and for the kind words! And I definitely think there’s something to what you’re saying about the psychology behind pricing. I think I even recall reading somewhere on Leanpub that they advise not giving away books for free (not positive off the top if I’m remembering that correctly, though).